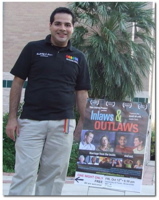 Hosted by the Gay-Straight Alliance, this screening will form part of the Inlaws & Outlaws Texas Outlaws Tour, and also coincides with the celebrrations surrounding National Coming Out Day on October 11th, 2007. The GSA of the University of Texas - Brownsville acts as a support group to provide an environment where GLBT students can be themselves without fear of judgment or harassment. This is achieved through public presentation of information relevant to GLBT issues and through donations to larger activist organizations throughout Texas and the United States. Since it's inception in Spring 2007, the Gay-Straight Alliance at the University of Texas at Brownsville has brought together students, faculty and staff members to work towards a common goal of gay civil rights and awareness of gay issues on campus and in the community. "As soon as I saw that Inlaws & Outlaws were going to be doing a Texas Outlaws Tour, I messaged them on Myspace to ask if it would be possible to have a screening down in Brownsville. As we further corresponded, it turned out that Inlaws & Outlaws would serve as the conclusion to the National Coming Out Week festivities. On Friday evening, we had our film screening of Inlaws & Outlaws. The event was a success to all who attended. Everyone, including the straight supporters in our club, were moved and gained a greater understanding of LGBT issues. The film reached out on so many levels: To the couples, the married, the singles (both gay & straight) and the widow(er)s. It is something that you will keep with you and will help remind you that the gay rights struggles are worth fighting for. In a comedic, yet very sensitive approach, know that this film will keep you wanting more until it's over. If you decide to have a screening, it will not be something you regret. The fee to host this screening is so small, compared to other documentaries and films and the staff you communicate will do all they can to make your screening possible. Make your choice today: Host an Inlaws & Outlaws screening. It really is the right thing to do!"